Have you ever dreamed of getting away from it all – escaping the politics, crowds, and daily rat race? Have you ever wished you could live like Henry David Thoreau, simply and self-reliantly in a small cabin in the woods? The Atchleys are the only human residents of this remote natural wilderness area. 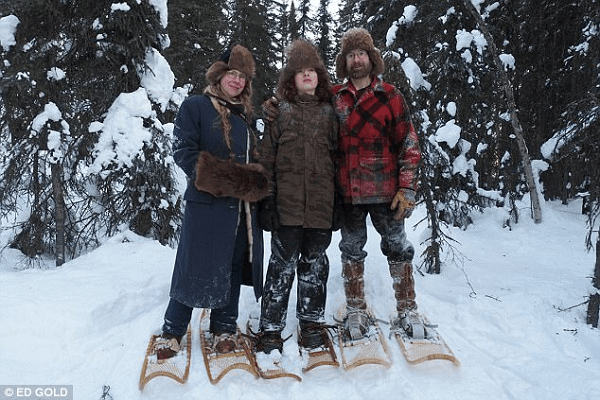 One of the western world’s most isolated families, their cabin is just 100 miles south of the Arctic Circle and over 200 miles from any roads. It would take them six hours to reach the nearest hospital in an emergency. 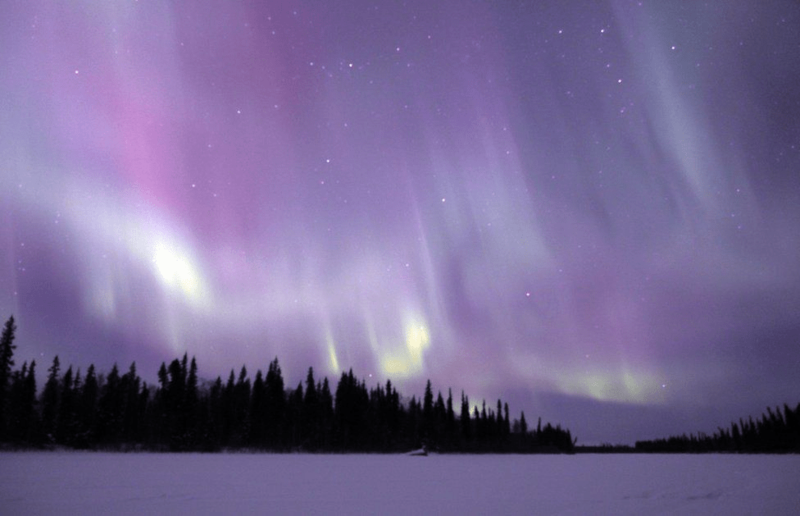 Their property is surrounded by the Nowitna National Wildlife Refuge, with only the passing of a distant plane occasionally intruding on their internet-free solitude. 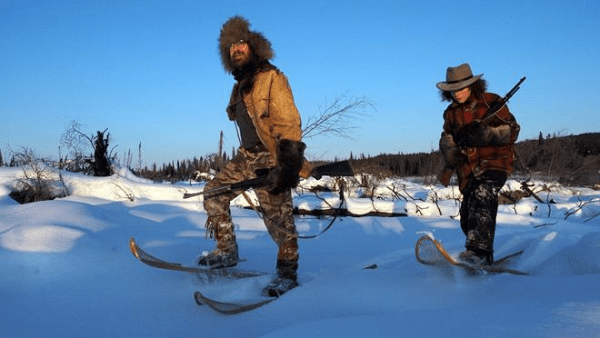 This homeschooling family lives a subsistence lifestyle among the wild animals where they hunt, fish, garden, and gather food. They eat everything they trap and shoot — including black bears, wolves, rabbits, ducks and beavers. Every autumn they shoot a moose, which provides them with most evening meals until spring. They also make rose hip wine, lingonberry jam, and herb teas. 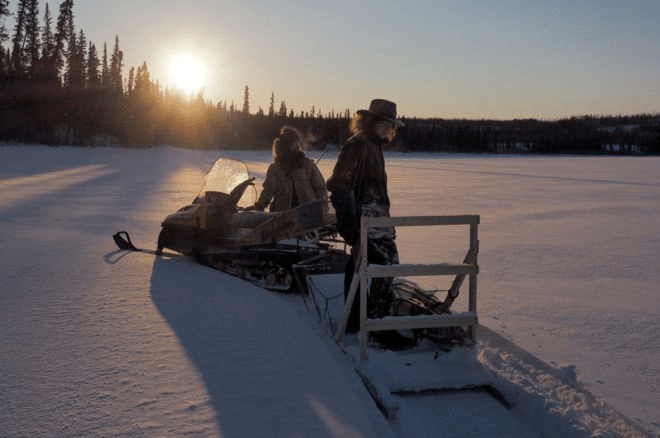 The Atchleys insist that they are blissfully happy, indulging their passion for extreme self-sufficiency in a beautiful but harsh land where temperatures drop to -85F in winter and just a trip to get groceries is a major life-or-death undertaking. They have to worry about marauding bears, hungry wolves, forest fires, thin ice, injury, freezing temperatures in winter, and dense black clouds of mosquitoes in summer. Their home escaped a wildfire in 2015 and firefighters who parachuted into the area were astonished to find the Atchleys living there. The risk from bears means never going outside without a gun. Mrs. Atchley wears a .44 caliber pistol, the only handgun powerful enough to stop a grizzly. In winter, the snow is waist-deep and they have to use snowshoes. In summer, the soil is a spongy bog in which you sink up to your knees. A trip to the general store and post office in Ruby, the nearest town, involves a 100-mile river journey on the ice by snowmobile in winter or in summer by boat. The Atchleys may be hardy frontier folk now but they certainly weren’t to begin with. Romey, 44, was a waitress before giving it all up to live in the far-flung region. Mr. Atchley, 52, was a “city boy” who grew up in Minnesota, had a degree in governmental theory, and worked as a computer expert. Both wanted to move to the cabin out of a general disillusionment with humanity and modern life. (Kind of like Captain Fantastic.) They were also determined to use up as few of the world’s resources as possible. Mr. Atchley honed the core skills he would need – building a house, running a chainsaw, shooting a moose – by living briefly in a native settlement in Alaska that was 12 miles from the nearest road. But that wasn’t nearly remote enough for him. After meeting Romey, who had recently arrived in Alaska, the pair purchased the one-room, 10.5 ft. by 13 ft. cabin beside a lake. They brought all their supplies in by boat, lugging them by foot the final mile to a home they hadn’t even seen yet. On their first night, a bear raided their supplies and it was a steep learning curve from then on. “When I moved out here, I would start thinking about things that could go wrong and get worked up with the fears,” says Mrs. Atchley. “What if somebody got appendicitis or what if our chainsaw broke and we had no firewood? But what that’s taught me is to stay in the moment.” Today they live on the same plot of land, but have expanded their home to its current 21 ft. by 26 ft. four-room complex with adjacent bathhouse/sauna. 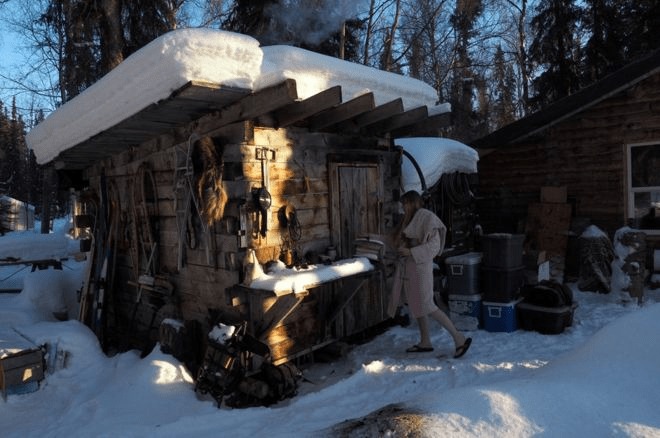 The Atchleys are so far off-the-grid that they’ve done away with pesky concepts like standard time, choosing instead to keep their own time to suit their needs, putting the clock as much as three hours forward or back depending on the Alaskan daylight. In winter, they generally eat breakfast at 4:30 pm before spending the short daylight hours doing repairs, cleaning and carpentry. 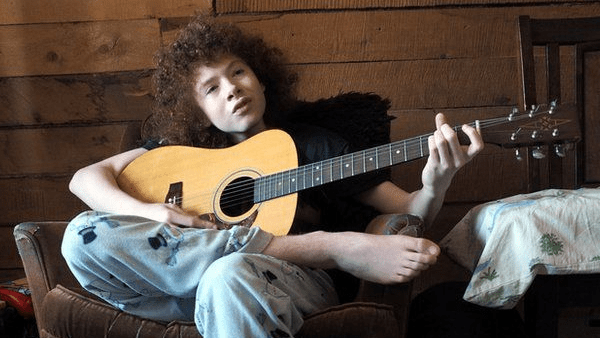 After dinner — which is invariably moose — at 10:00 pm they will talk, play their guitars, and write (both parents are working on autobiographies), before going to bed at around 4:00 am. Their electricity is provided by solar panels and a large bank of golf cart batteries which are recharged for four hours every day by a gas-driven generator. This gives enough power for lighting and to recharge their laptops. But with no internet, their only means of contact with the outside world is a satellite phone they have for emergencies and for Mrs. Atchley’s monthly half-hour chat with her family in Alabama. Heat is generated through two wood burning stoves, and there’s no hot water unless they boil it themselves. The water has to be pumped by hand from a spring running 27 feet under the house and stored in buckets. Much to their eco-friendly regret, they have to burn their trash. Grocery shopping is annual expedition when they stock up on supplies. 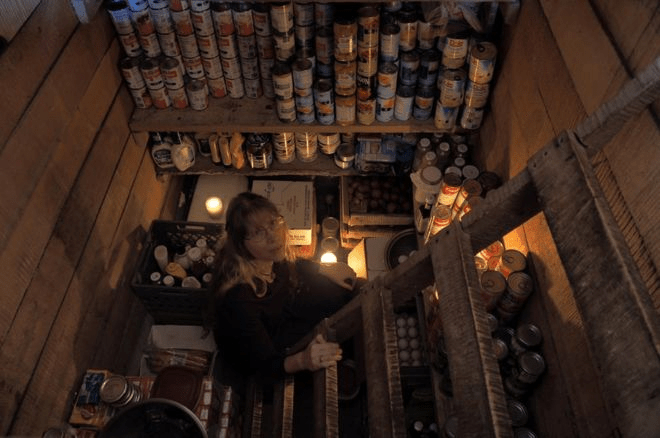 Preppers at heart, they store two years’ worth of canned food in their pantry, amounting to some 1,000 cans. A six-foot-deep wood-lined pit dug into the permafrost functions as the family’s refrigerator freezer. The trio leave their remote cabin for a month’s holiday every year, when Mrs. Atchley and Sky visit family in Alabama while Mr. Atchley sells his homemade tie-dyed t-shirts, tanned hides, and animal pelts in the city of Fairbanks, a 200-mile snowmobile ride away. Mr. Atchley also occasionally works in a goldmine near Ruby if they need more money. However, by living off the land, he says they can make do on $12,000 a year. Treat yourself to a heartwarming tale of true friendship tested through difficulty in The Adventures of Barefoot and Boofoot! The story is about an 8-year-old boy who explores his relationship with the earth through his adventures with the animals around him, spending all his free time running in the woods, living in harmony with the natural world, learning the simple yet profound lessons that nature imparts. While similar to Ronja the Robber’s Daughter, Mrs. Atchley’s book offers a glimpse into an alternative lifestyle through her depiction of a child living a traditional, nature-oriented life in modern times. Like the boy in the book, teenage son Sky has grown up in a natural world almost solely defined by his parents, their pet dog, and his imagination. Sky – who’s never set foot in a school – is taught everything he needs to know by his mother and father. They focus on skills-based learning, such as mastering math through cooking or carpentry. Other useful learning activities include milling lumber; building cabins; making a boat; working on engines; and survival skills. The previously unseen life of the Atchley family has been now documented by British freelance photojournalist Ed Gold, who spent three weeks living with them. He was lucky to even stumble across the Atchleys’ intensely private world, which they were gracious enough to share with him. While traveling in the area, Ed overheard a conversation about a remote family deep in the wilderness. It took a series of five connecting flights for him to reach them so far off the beaten path.